As we age, sleep can be an increasingly frustrating issue. And especially at the holidays, extended family, higher expenses and extra social activities can leave us stressed out and exhausted. With so much on our mind, insomnia creeps in. Yet the next day, we’re expected to recover quickly for the next big event. Adrenaline can only carry us so far. According to a 2017 survey by ReportLinker, the average American household contains 7.3 screens. Consider not keeping your phone next to your bed. Alarm clocks are easy to come by and a small price to pay for better sleep and increased focus on what matters. But hacking your sleep is also about big screen time. Consider shutting down your computer two hours before you get into bed. And try reading old-fashioned books. The National Institute of Health reports that light emitted from e-readers are disruptive to sleep. Dr. Peter Dorsher, a chronic pain specialist at the Mayo Clinic’s department of physical medicine and rehabilitation calls myofascial release “a rediscovery of the healing principles of traditional Chinese medicine.” And acupressure makes it happen. The electricity-free Acuswedemat’s 14,000 spikes targets your body’s 225 areas of tension. This creates myofascial release, loosening the tight muscles and tension created during a work-out or race. Endorphins are released throughout your system and your mind relaxes too. 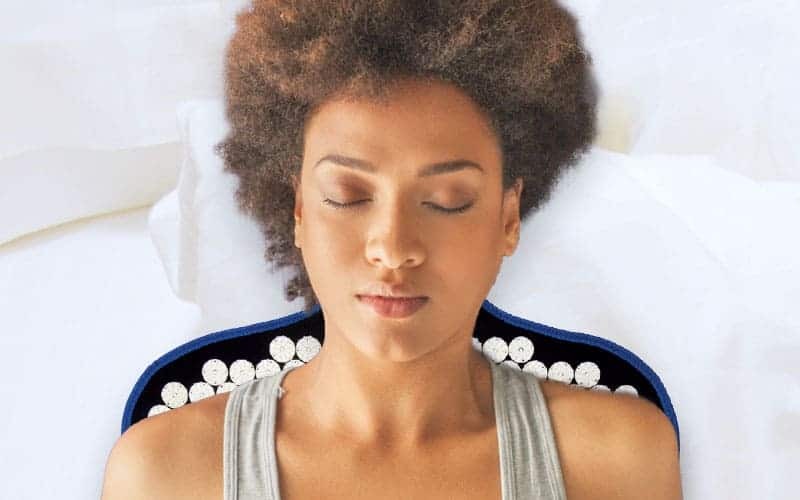 Thirty to forty minutes on an Acuswedemat (find the best acupressure mat positions for you) will both reduce your pain and hack your sleep for a more restful night. The pineal gland needs darkness to produce the melatonin that tells your body it’s time to sleep. Light confuses this process. That’s why the heavy drapes in hotels keep you asleep longer. While a connection to the outside can feel pleasant, and a flickering screen often puts us to sleep, try and resist the temptation. You can hack your sleep with ease if you set up your environment correctly. If you have trouble clearing your mind, deep breathing is one of the best ways to lower stress in the body. And hacking your sleep starts with decreasing your stress. These techniques are far from new. In India, breath work is called pranayama, which literally means control of life force. Pranayama is a regular part of yoga practice and practitioners have been using pranayama as a mind-body tool for thousands. Easy to access tools for deep breathing practice include yoga, meditation and HeartMath.